Every now and then, I like to share pictures that inspire me. And with summer approaching, I’ve been soaking in as much exterior inspiration as possible. We have a pretty blank slate. Sure, we have grass and a few trees and bushes, but we have a lot of work to do and I can’t help but day dream about a little bit more landscaping. Of course, I have high hopes that the wind will actually die down and we can enjoy our yard and patio. It hasn’t happened yet, but I have hope! One of the things that made the list for our 2014 project goals, is the addition of more landscaping. It’s going to be on our yearly goal list for years to come, but I can’t help but share what’s inspiring me. You never know, you might be looking for a little exterior inspiration as well! I’m definitely going to be adding more planters this year, these are lovely! Ferns and big lanterns, I love ’em! That door is pretty perfect too! Source: unknown, let me know if you know where it’s from! 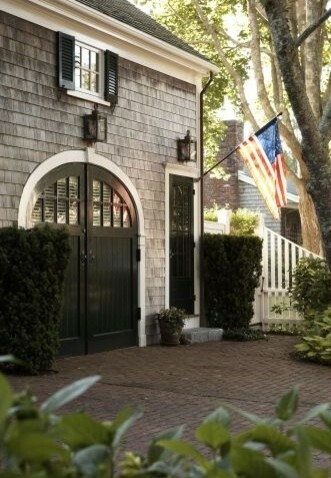 Love those black exterior doors and the flag… absolute perfection! I’ve also become slightly obsessed with this dinner bell. This one is similar. So there you have it, a few things that have been inspiring me lately. You can see more things that I love on Pinterest. And right at this second, I’m ready to jump up and get started… Happy Weekend! P.S. If you follow me on Instagram, you know that we’ve been planting corn! Things are about to get green around here! Love the wreath on the old door and the gravel and wood walk. Oh we so need to do some work in our yard too and more landscaping is definitely in order. Great inspiration pics. My husband’s grandma passed away in January and they sold her house. As part of the cleaning out process, we ended up with a fabulous old dinner bell. It’s so dirty and icky, but I know it’s going to have such a fun second life living with us. Your first picture made me smile and has me wanting to work on the dinner bill asap. I believe the source for the barnwood garden path photo is Funky Junk Interiors. I know she did one like that. Love all the photos you compiled in this post. Some so simple but elegant! I am so glad warm weather is here to stay for a while, aren’t you?